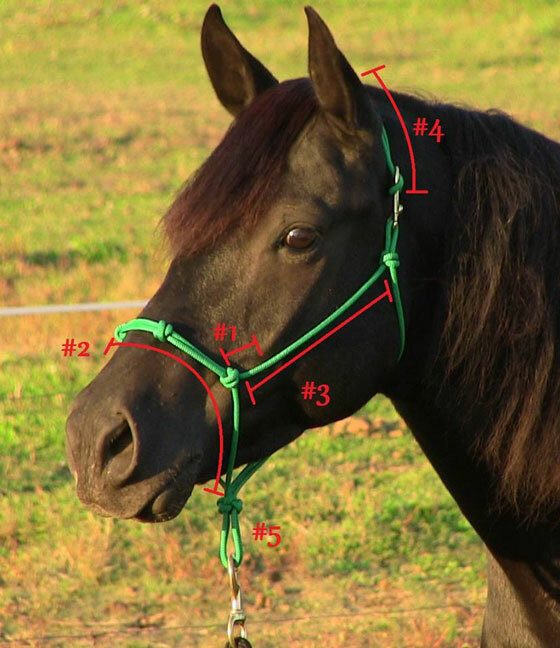 The image to the right and below, shows you (in red) how to measure your horse for the correct size Do Or Do Knot® Halter. Use a soft fabric tape measure or a cut piece of string/twine and then measure it; you want it to be snug but not too tight. #1- Correct placement of the noseband below the point of cheekbones, about 2-3 finger widths. 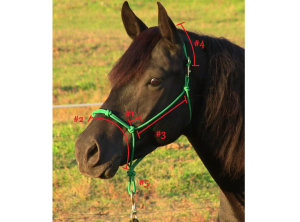 #2- Measure the full circumference of the noseband. Remember that as the halter "settles" with wear, the noseband can get 1-3" bigger around for a looser fit on your horse. #4- Poll/Crownpiece length (optional) should be measured from end to end. You can always shorten the crownpiece on your own, so it's better to have it too long than too short.